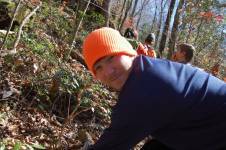 I am a fairly new hiker and have hiked in the Great Smoky Mountains National Park, on the Appalachian Trail in Georgia, and at a few state parks in Mississippi, Tennessee, and Alabama. I initially obtained slightly heavy gear, however, I am currently making efforts to go lighter. I love my tent and appreciate a warm drink in the morning, as well as a warm meal at night. So far my distance has averaged around 10 mi (16 km) per day, depending on terrain. My wife or my son typically tag along with me on my hikes. 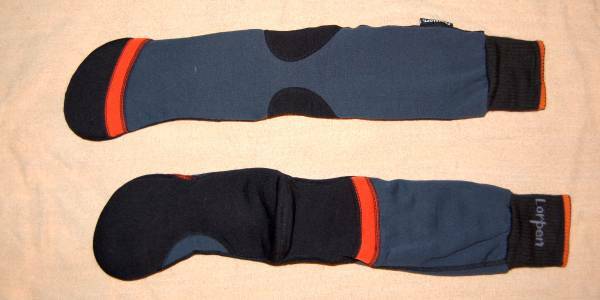 **All weights and measurements in the IR are based on the size large (L) socks. I will post the weights and measurements for the extra large (XL) socks in the FR. Two pairs of the Lorpen Expedition Polartec / PLoft 1 socks (hereafter referred to as the "socks") arrived at my door on December 16, 2009. The socks are wrapped one pair to a box, and the box is loaded with various types of information. Located on one side of the box is the Recycled Material logo as well as laundering instructions in English as well as 3 other languages (of which I'm not sure of), which are as follows: (1) Wash in warm water, 35 C (95 F) max. (2) Do not iron. (3) Tumble dry at low heat, 55 C (131 F) max. (4) Do not bleach. (5) Do not dry-clean. On the back of the box is more information concerning the Primaloft and Polartec materials used in these socks, as well as a picture showing the three different layers of the socks. There is also a picture showing the left and right anatomical shape of the socks. Finally near the bottom of the box, still on the back, is the contact information for Lorpen. The last side of the box has the word "open" and arrows pointing to where the box opens. The front of the box opens to the right and is laid out similar to that of a book. Each side has one sock attached with a small plastic tab. Once the box is open there is still more information inside. To the left (facing) is pictures of four different heights and thicknesses. The tallest sock is highlighted as well as the first level of thickness, representing that these are the tallest socks available, however they are the thinnest of four different layers of thickness offered. To the right is an animated thermometer, red at the top and blue at the bottom. There is an arrow that is very near the bottom indicating that these socks are to be used in cold weather, however no specific temperatures are listed. These socks are marketed as "insulated expedition" socks that "have been engineered to perform in the coldest environments on earth." This statement is further illustrated with the picture on the front of the box, which is of a backpacker climbing a snow covered mountain. The amount of clothing that the backpacker is wearing is a hint of the temperatures obviously being frigid! From the feel of these socks, I can believe that these socks will be very warm on a cold day! Due to the thickness, and the soft comfort of these socks, my first thoughts were "Wow, these are slippers, not socks!" These socks really are impressive. They measure 22.5 in (57 cm) from the tip of the toes to the top of the cuff, while lying top-side up. Starting at the top, there is a 3 in (7.6 cm) ribbed cuff, dark gray in color with a single orange stripe running around the top. Since the socks are shaped so anatomically correct, I know that the Lorpen name printed on the top cuff will rest on the back of my leg. The rest of the sock is a lighter gray color with an orange stripe across the back which is where the extra Primaloft insulation begins. The Primaloft runs down the back of the heel and even around the front of the ankles, down the entire length of the foot bed, over the front and top of the toes and stops 3 in (7.62 cm) from the tip of the toes. 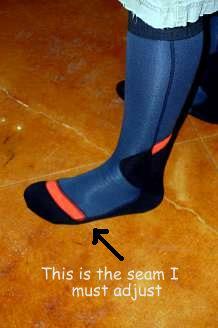 Located here is another orange stripe running across the top of the foot.The Primaloft insulated sections of the sock is black in color. These socks are very obviously made to specifically fit the left or right foot, however, there is no marking anywhere on the socks that specify this. Also, there is a heel box built and sewn into the socks. This looks like it will be a very comfortable feature as it will actually fit the contour of my foot more properly. The socks also stretch considerably, which will allow even more comfort as the socks move with me, but continue to flex back and stay close to my foot, keeping me nice, warm and comfortable. From what I can tell, the entire inside of the sock is lined with a layer of Polartec Powerstretch, except for the cuff at the top which I believe is made from Lycra / Nylon. The Polartec Powerstretch lining the socks is very soft to the touch, and feel like they will be very warm and comfortable while wearing. 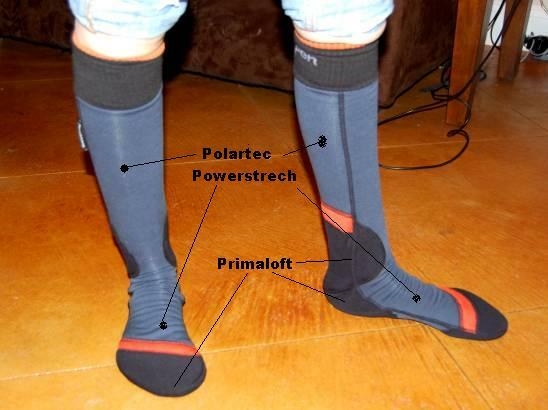 The Primaloft has been sandwiched between two layers of Polartec Powerstretch and has been placed at the stress points or heavy weight bearing points on the socks. These extra layers should provide comfort, as well as extra warmth around the toes, which is always good! The Primaloft is stated to be "incredibly soft, lightweight, and breathable with excellent water repellency to help keep feet warm, dry, and comfortable." From the feel of these socks, I think they will do just that, but I will definitely find out for sure in the coming months! When I received these socks they came in a size large, however I need a size extra large. I have contacted the customer service at Lorpen, and they will have the replacement socks in the mail as soon as possible! The customer service at Lorpen was very helpful, and a pleasure to talk with. I will report back in my FR with the follow-up service as well as with the specific weights and measurements on the size extra large. I like these socks so far, however I have not had the chance to slip one on for the full understanding yet. On a good note, the "over the calf" design seems like it will help out very well with those drafts that may sneak up my pants leg and try to steal away my warmth. Also the thick Primaloft padding looks like it will provide excellent comfort and warmth, especially around the toes, which is usually the hardest part of my feet to warm up. Some things that I will be looking into however, is the seams. The seams are flat, however the socks are so thick, the seams are relatively thick as well. 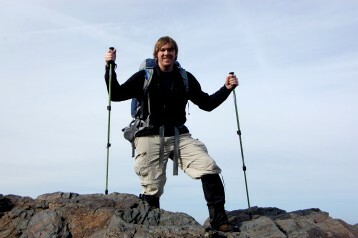 I will want to see how they will feel while walking, or even more so, while hiking with a 50 lb (22.7 kg) pack on my back. I am also curious as to how well they will fit inside my boot. The toe-box has a lot of insulation, which makes it very thick. This concludes my IR on the Lorpen Expedition Polartec / PLoft 1 socks. I would like to once again thank Lorpen and Backpackgeartest.org for the opportunity to test these socks. Please check back in 2 months for the FR. I finally got to wear them! When the socks first arrived they were a size Large, which is sized too small for me. I contacted Lorpen (North America) by phone and explained what happened and they were pleased to send me the correct size socks. (They even told me to hold on to the ones I currently had.) Two pairs of the correct size (XL) socks landed on my doorstep around the 22nd of January. They were just in time for a 3 day hike that I was about to head out on to the Great Smoky Mountains National Park (more on that soon). The XL socks that arrived were the same build and quality (as stated above in the initial report) as the Large size socks in all aspects except that the XL weighed in at 4 oz (113 g) a pair. The XL socks measure the same length from the top of the cuff to the tip of the toes while lying top-side up. What differentiates the L from the XL is found in the measurements on the plantar (bottom) side of the sock from the tip of the toes to the back edge of the heel box. The Large measures 10.25 in (26 cm) and the XL measures an even 11 in (28 cm). I finally got to slip my foot in the socks, and they were nice. On initial impression, from the top down, the cuff is constricting enough to keep the sock up while wearing around the house. The Polartec material that surrounds my calves are very comfortable and soft feeling and were not constricting at all. And the best part, the amount of padding found on the bottom of the sock is very much like a slipper, very soft, very comfortable, almost to the point of luxurious. I tried them on with my Merrell hiking boots fearing that there would be too much padding, particularly in the toe box but they fit rather well. The padding around the toes fit fine inside my boots without compressing my toes any more than normal. However, one thing I have to do when wearing these socks is to make sure that the laces on my boots are loosened a lot, have the tongue pulled way forward and carefully insert my foot (one at a time). If while wearing these socks and I cram my foot into the boot that isn't opened enough the sock will bunch up so I just take care of this by placing my foot in the boots the right way the first time. I must make note that the seams are fine except for the outside seam that runs along the side of my foot (see picture to left). I have to pay particular attention to this seam whenever I wear these socks with my boots, but I can usually fix the problem while putting my boots on. After inserting my foot into the boot I just reach down and tug on the sock a little to position the seam off my foot, tie up the laces good and tight and then they are all set. Even during / after a long day of hiking they are still in the correct position. Like I said, the socks arrived a few days before my trip to the Great Smoky Mountains National Park at the end of January, so I was able to take them out pretty much immediately. So me and a group of guys headed out for a 3 day trip (which I considered my "bachelor party") in the mountains. We began hiking at the Alum Cave Trail head at an elevation of 3,830 ft (1,167 m) and topped out on the summit of Mt. LeConte at an elevation of 6,593 ft (2,010 m). Just the week before we arrived there were 4 ft (1.22 m) snow drifts and the trails were covered with snow. 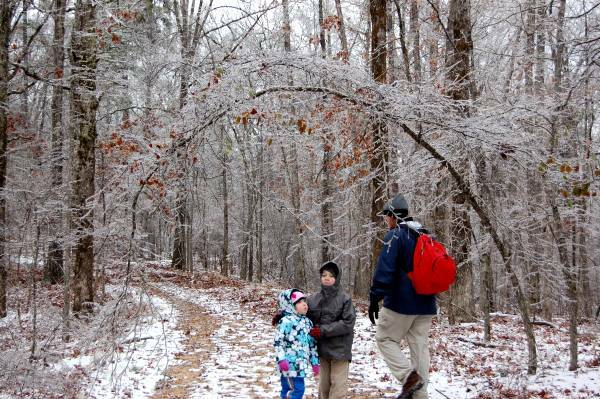 However, the temperatures began to rise so it all began to melt and a large portion of the snow was melted away by the time we made our hike, especially on the lower elevations, so the trails were wet. Some of the trails were actually small streams. The days that we were there the temperatures ranged from around 20 F (-6.7 C) at nights to around 40 F (4.4 C) during midday. So the trail conditions varied from wet rocky ground, to rocky ground with icy patches until we neared the summit of Mt Leconte. We began hitting large sections of trail covered in snow and soon began post-holing through the snow. I took both pairs of the XL socks with me so that I could alternate them each day. I hiked in them all 3 days as well as slept in them for the 2 nights that we were out. The first thing that I noticed was how warm they kept both my feet and my lower legs. Coming out of the warm bed early the first morning and stepping out into the cold I figured I would have to get cold and then get settled with the temperature, however that was never the case. The socks simply kept my feet warm, even while post-holing through snow up to my knees. I will say that while crossing the many streams, occasionally my foot would go under water. While water never entered my boot, I did notice a coolness, but it always went away very quickly. They also did a remarkable job at keeping my feet warm during the night. I did use toe warmers in conjunction with the socks when I first laid down but they only last a few hours so during the wee hours of the night my feet relied on the socks alone, and they did great. When I woke up in the mornings my feet felt as warm as they did when waking up in the bed at my house. At the end of the day I would pull off the pair that I had worn throughout the day and put on the other pair. When I pulled the socks off I turned them inside out and I could feel a slight dampness. I believe that this was from my feet actually sweating. I slept with them inside my sleeping bag (turned inside out) and when I woke up in the mornings they were still damp feeling, but I think that this was due to the cold. I would put them back in my pack for the day and at the end of the day when I pulled them out they would be dry. As for blisters, I never got one. However I did get a hot spot twice. Both times were during the first part of my hike each morning, and while going downhill. My theory to this is that the socks are so thick on the bottom that they actually allow my foot to slide, but after wearing them for about an hour or so the cushion will compress somewhat allowing my foot to become more stable, or stationary. I say this because after the first hour or so I never felt another hot spot throughout the day. One other issue I had is with the cuff. It's not that the cuff is too tight, or not tight enough, but rather where the cuff is sewn to the sock there is a thick seam that seems to dig in and cut off some of the superficial circulation. Near the end of the day my leg at this area is very itchy and there is an indention left in my skin. I have been able to see the indention for just a little over an hour after removing the socks. Other than this hike, I have worn the socks approximately 10 - 12 days around town, to work, or on some short day hikes. During these times I have no complaints. They are great for cold days and I was very glad to have them many of these days. I will say that one day I was so hot in them that I had to change out of them while at work! So far I have enjoyed these socks. They are definitely cold weather socks. For temperatures much over 40 F (4.4 C) these socks may be overkill, that is unless I am lounging around outside in the cool breeze or at the camp site. Very importantly, they are super comfy. I have finished concrete floors throughout my home and these socks are excellent for walking around in for both comfort and warmth. In the field they are great as well. However, I will continue watch them for the hot spots, and for the dampness at the end of the day. As temperatures are beginning to warm up around here I am really going to have to get more time in on them soon so I am planning to try to get out on a few more overnight trips very soon. But for now I will leave it with this picture of me at Charlies Bunion on the Appalachian Trail this past January, of course I am wearing the socks too. Be sure to check back mid-May for my long term report. I was able to wear these socks while on one other day hike to Big Hill Pond State Park. We were lucky enough to get some snow the day before so the family and I loaded up and took off. While it was not much snow (as seen in the picture below) it was enough to get out and have fun with. The temperature was around 28 F (-2 C) so we were all bundled up nice and good. We just took a nice walk through the woods staying out for about three hours. Other than this I wore them another six days just as my daily socks. I wore them with a pair of Crocs while at work and with a pair of all leather Dr. Martens boots during the rest of the day, except for while I was at home, which I then just wore them around the house without any other type of footwear. I also wore the socks on four other daily walks. These were on the paved roads near my home and on a paved walkway at the local city park. The temperatures were between 30 - 40 F (-1 - 4 C) and it was all relatively flat. When I got these socks I expected two things right off the bat. Number one, to keep my feet warm, and number two, to be comfortable. These socks have met both of those expectations with flying colors. The coldest that I have worn them while hiking was near 20 F (-6.7 C) however I have worn them around the house in temperatures colder than this and they did a super job at keeping my toes warm. As well, the socks have provided supreme comfort while wearing them. Other than this, the socks have been quite durable. They have withstood about 30 days of use and at least 20 washings. There are no thin spots worn at the heel or any where else for that matter. The socks still fluff up nicely and feel as comfortable as the first day that I put them on. The stitching is still intact with no loose threads. There is a very small amount of piling at various spots on the socks, but nothing that warrants any serious concern. While wearing the socks with my Merrells, which are my typical hiking boots, the socks were a good fit. I was initially afraid that the socks would be too much volume for the boots, but the socks turned out to fit quite nicely inside the boots. The extra sock filled the boot nicely and due to this, I believe that the socks actually aided in keeping my foot slightly more stable while hiking. I did experience a hot spot while wearing them to hike in in the Great Smoky Mountains National Park, however no blister ever came out of it, and the hot spot did not last long before going away. The socks were too thick to wear with my normal tennis shoes which is kind of a bummer, but this was ok because they brought life back to an old pair of all-leather Dr. Martens. These boots are about eight years old and over time have typically become a little uncomfortable to wear for more than a couple of hours, however, the large amount of cushion from the Primaloft foot bed has enabled me to wear these boots for a full day with a nice amount of comfort. (Maybe I should just put some new insoles in these boots as well.) While wearing these socks with my Crocs while at work I have to use a bit of caution. Due to the amount of padding on the bottom of the socks and the wide foot bed and opened-ended-heel of the Crocs, it can be a bit slippery. Still, it is a rather comfortable combination. Now that the temperatures have become quite a bit warmer (it has already been over 90 F (32 C) here) I will not be wearing the socks for a while. Once the temperature rises to around 40 F (4 C) or higher, the socks are too warm to wear them comfortably. These socks will not see any more use until the temperatures start to fall again, which will be towards the end of the year, but I will be more than happy to pull them out then. Again, I would like to thank Lorpen and BGT for allowing me to test these quality socks. 1. These socks do a great job keeping my feet and legs warm in sub-freezing temperatures. 2. 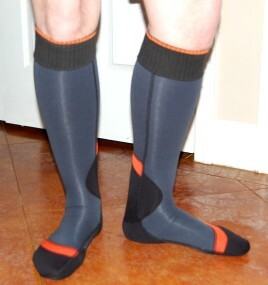 The socks are padded very well making them very comfortable to wear. 3. The socks are very soft against the skin. 4. The socks are constructed very well, and have thus far proved very durable. 1. The seam where the cuff is sewn to the sock digs into my leg after wearing them for a while. 2. The socks are too thick to wear with tennis shoes. 3. The prices I have seen on these socks are rather high.